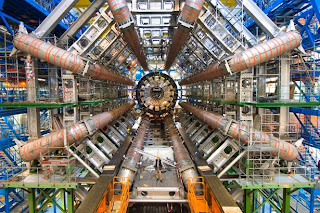 Haq's Musings: Pakistani Physicists at CERN Help Find "God Particle"
Pakistani Physicists at CERN Help Find "God Particle"
Hoorani, as you know, is a Karachi-born person who attended Karachi University. Your article should have pointed out this important fact. My sister attended one class with him when he was at KU. I think you have confused the news about neutrinos travelling faster than light with the search for Higgs Boson. AFAIK, there has been no news regarding the discovery of the Higgs boson. It is a myth that Salam was persecuted in Pakistan. He was appointed Chief Scientific Adviser to the Government of Pakistan and served in that post from 1960 to 1974 (15 years) and was awarded Nishan-e-Imtiaz, Pakistan’s highest civilian honour as well as the Sitara-e-Pakistan. He was one of the co-founding directors of Pakistan’s Space & Upper Atmosphere Research Commission (SUPARCO) and set up the Theoretical Physics Group at the Pakistan Atomic Energy Commission (PAEC). 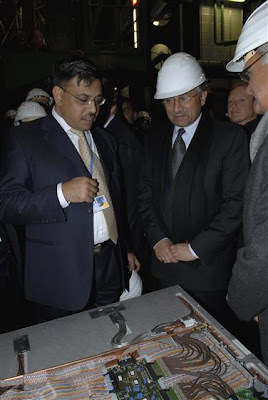 He also played an importand role in the development of Pakistan’s nuclear weapons programme. He also co-founded PINSTECH. Salam had an office in the Prime Minister’s office during the time of the development of Pakistan’s nuclear programme. It was Salam who advised Bhutto to call Dr. A.Q. Khan from Holland. Bose was an Indian and India should be acknowledged for Higgs Boson. Some Indians are claiming credit for Higgs Boson because of Bose. The fact is that Bose had nothing to with the higgs boson work directly. Higgs built the theory based on work of Bose but Bose was never involved in that work. This work was done by 5 other theorists namely R. Brout, F. Englert, G. S. Guralnik, C. R. Hagen, and T. W. B. Kibble . Bose’s work with Einstein is extremely important but he had NOTHING to do with the higgs boson itself. All bosons are directly named after Bose but that doesnt mean he is responsible for each of their discovery. Its more of an honor for Bose than a direct contribution. Please try not to say things over here that you know nothing about because you mislead people with your ignorance! Mavalvala did her BA at Wellesley College in Physics and Astronomy in 1990 and a Ph.D in physics in 1997 from the Massachusetts Institute of Technology. Before that, she was a postdoctoral associate and then a research scientist at California Institute of Technology (Caltech), working on the Laser Interferometric Gravitational Wave Observatory (LIGO). She has been involved with LIGO since her early years in graduate school at MIT and her primary research has been in instrument development for interferometric gravitational-wave detectors. She also received the prestigious MacArthur Foundation Award in 2010. Mavalvala received her early education from the Convent of Jesus and Mary school in Karachi, an administration official from the educational institute confirmed to Dawn.com. She later moved to the United States as a teenager to attend Wellesley College in Massachusetts, where she is said to have a natural gift for being comfortable in her own skin, according to an article published on the sciencemag.org website. “Even when Nergis was a freshman, she struck me as fearless, with a refreshing can-do attitude,” says Robert Berg, a professor of physics at Wellesley. "I used to borrow tools and parts from the bike-repair man across the street to fix my bike,” Mavalvala says. In an earlier report, Mavalvala's colleague observed that while many professors would like to treat students as colleagues, most students don’t respond as equals. From the first day, Mavalvala acted and worked like an equal. She helped Berg, who at the time was new to the faculty, set up a laser and transform an empty room into a lab. Before she graduated in 1990, Berg and Mavalvala had co-authored a paper in Physical Review B: Condensed Matter. So she grew up without stereotypical gender roles. Once in the United States, she did not feel bound by US social norms, she recalls. Mavalvala says that although it may not be immediately apparent, she is a product of good mentoring. From the chemistry teacher in Pakistan who let her play with reagents in the lab after school to the head of the physics department at MIT, who supported her work when she joined the faculty in 2002, she has encountered several encouraging people on her journey. Although the discovery of gravitational waves, that opens a new window for studying the cosmos, was made in September 2015, it took scientists months to confirm their data. The researchers said they detected gravitational waves coming from two black holes - extraordinarily dense objects whose existence also was foreseen by Einstein - that orbited one another, spiraled inward and smashed together. They said the waves were the product of a collision between two black holes 30 times as massive as the Sun, located 1.3 billion light years from Earth.